I liked Aimee Carter's Goddess Test series well enough, but Pawn completely blew me away. It's so much better than the Goddess Test series. The pacing has tightened, the writing has improved, and there's lots more action and drama. I'm happy to say that Carter's writing only gets better with each book! Like so many others, I'm tired of all the dystopians constantly being published. 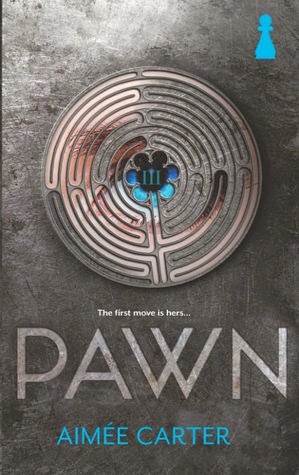 Pawn, however, manages to bring freshness and originality to the dystopian genre. I was impressed by the world-building and the way Carter explains how the world is set up. Her writing is stellar and her pacing has improved so much from her previous books. I honestly couldn't put this down, and I was never bored for a moment while reading it. Oh, Kitty. She was a really fun main character. She's so spunky! I love how she always had a witty comeback and was so determined to become more than a pawn. And for those who are afraid of a love triangle, there is none. Instead, the romance is sweet and cute. And the plot? Oh my word, the plot left me breathless. There's so much drama and political intrigue. People are constantly hiding secrets and double-crossing one another, and you never know who Kitty can trust. In a way, it reminded me of Katniss in The Hunger Games. She was also a pawn to President Snow, much like Kitty is to the Harts. There's tons of action in Pawn, too, up till the very end. The story ends with a bang that will leave you dying for the next book. I'd recommend Pawn to everyone, especially if you're a fan of The Hunger Games - and I don't say that lightly. This was a fast-paced, edge-of-your-seat read that really sticks out from all the other dystopians with its high level of intrigue, wit, and action. I can't wait for the sequel! *Thanks to Netgalley for sending me a free copy in exchange for an honest review! "Kitty," he said, as if he was testing out my name. "Is that short for something?" "Yeah," I said. "It's short for 'my mother was insane and had a thing for cats.'"